This week, French Fridays with Dorie brings us another recipe that is seemingly fancy, hence difficult, and turns out to be “elegant and easy”. 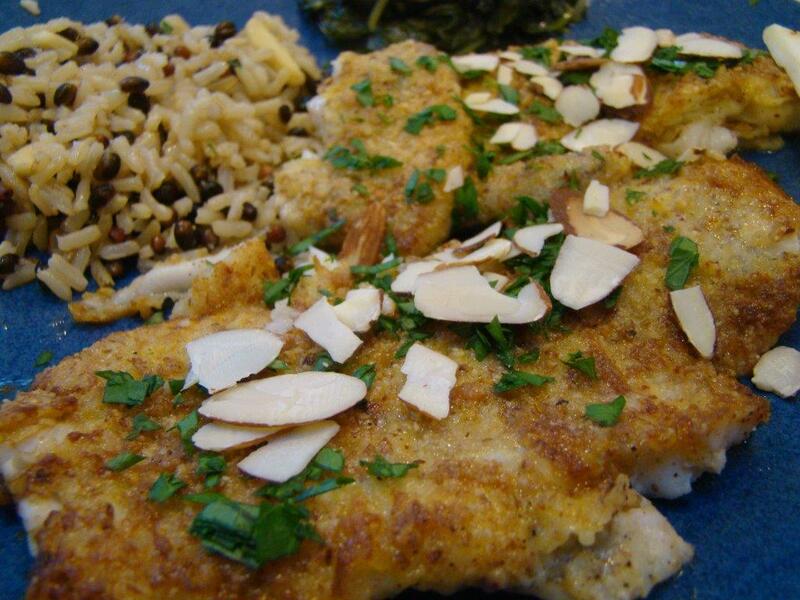 Almond flounder meunière is a cross between sole amandine and sole meunière, made with flounder instead of sole, obviously. Doesn’t that sounds super French. 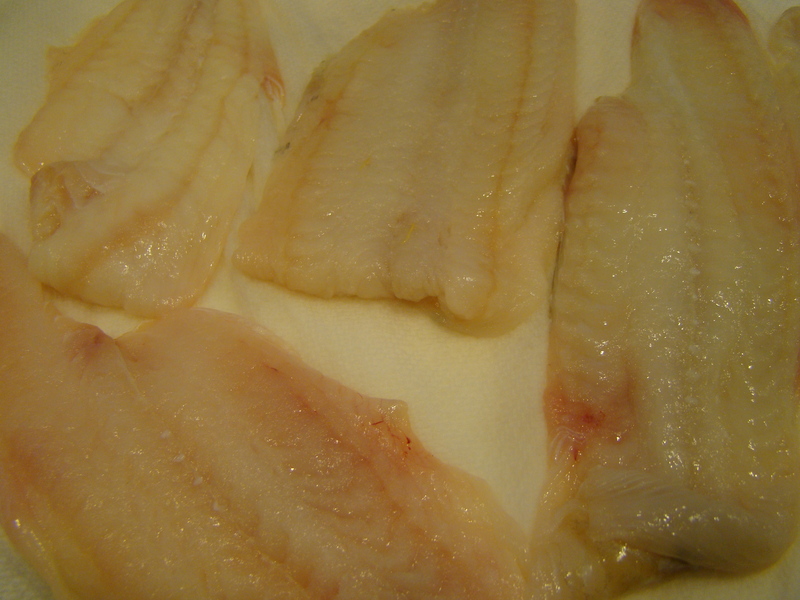 Lucky for me, flounder was on weekend special when I went to Whole Foods. $8.99 a pound. How fortuitous! I loved the technique of brushing the fillets with egg yolk before dipping it in a mixture of ground almonds, flour, and lemon zest. It was easy and much less messy than dipping in multiple bowls. 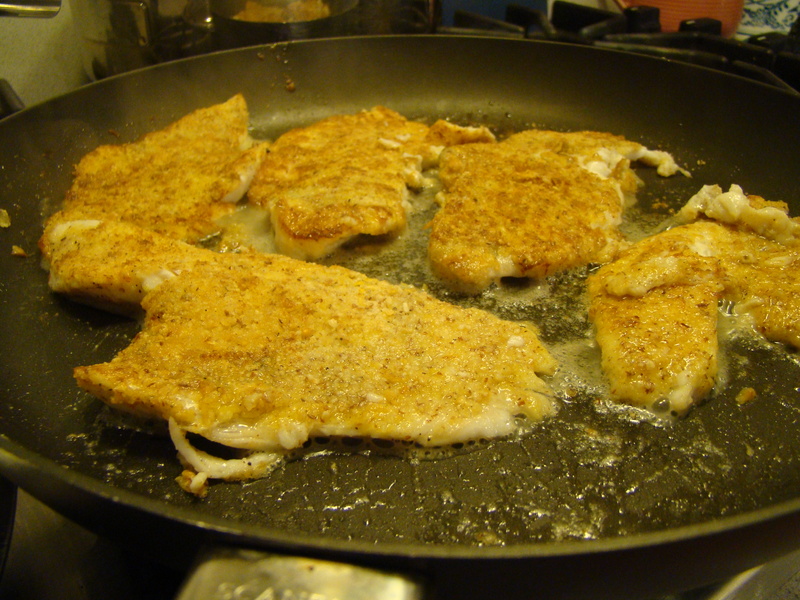 Butter gets browned in the skillet before briefly sautéing the fish on both sides. The browned butter didn’t really do anything for me. And, even though I thought I was using plenty of butter, there really wasn’t enough to spoon over the fish as instructed. The end result was wonderful. Delicate fillets of flounder with the nutty crust, topped with a squeeze of lemon, chopped parsley and some toasted almond slices. With some brown rice medley and sautéed spinach on the side, it was a perfect meal. I made it on Sunday, but it was easy enough to make on a weeknight. The only disappointment is that I made enough for two, we polished it off, and there were no leftovers. There’s not much else to say about this one, except to give it thumbs up. Check out how the other bloggers made out with their French fish here. We don’t post the recipes, but consider getting your own copy of the book, Dorie Greenspan’s book Around My French Table. Maybe you’ll even want to cook along with us on Fridays. You’ll have fun, I promise. Posted on 4 May 2012, in French Fridays with Dorie and tagged fish, French Fridays with Dorie. Bookmark the permalink. 21 Comments. I just made this tonight and it was a winner! Yours looks delicious! There definitely was not alot to say about this :-) I was surprised to actually find the flounder for this this one. It was a very quick recipe that could fit into weeknight meal planning, for sure. My post was really sort too – short of wham, bam, thank you ma’am recipe. Glad you enjoyed it & your fish looks buttery & delicious! Elegant and easy is a perfect description of this dish – I loved it too. I enjoyed this one too. Your dish looks terrific. I’m with you, the brush of egg yolk made this much more manageable plus not so heavy. I loved brushing the egg wash on too, so much neater than the multiple bowls technique. I had been wondering why the recipe title sounded familiar, but didn’t make the connection to sole amandine and meuniere, I’m so glad you mentioned it. Your dinner came out beautifully! Your Flounder Meunière looks so delicious. Brown rice and spinach sound great as side dishes – I also felt that this recipe did not need lenghty explanations, it is simply wonderful, easy to prepare and everyone seems to like it! What a great way to prepare fish! Betsy, Your flounder looks perfectly delicious! This was a wonderful way of cooking the fish! We really enjoyed it! I thought the browned butter added such a nice flavor to the fish. Have a great weekend! Enjoying the bees? Fantastic looking! I agree two thumbs up – our dog was desperately trying to try the fish, I guess it smelled great even to her. Hope you have a wonderful weekend! The crust on yours is so pretty, Betsy. It looks like it was a terrific meal. Yes, this was easy enough to fix on a weeknight because that’s what I did and it didn’t take much time at all.That was a really good deal you got at Whole Foods. I hope you have a great weekend! Very pretty! We didn’t have any leftovers either, even though I doubled the recipe! Betsy, I think in a few weeks I am going to try this fish again and will go to Whole Foods. It’s a bIt of a huff to get there but worth it for the quality of the food, particularly the fish. I usually don’t buy fish anywhere else but this week……..skai. You’re right, not much to say about this delicious recipe. At least the skai version need an explanation – something to write about! NICE POST. I totally agree – easy & elegant. We will definitely make this again. Hi Betsy – Your meal looks delicious, I really enjoyed this week’s recipe too. Then again, I seem to be partial to the easy ones. Also, as requested I added a bit more info on those croatian potatoes. They too are very easy. I agree this is so easy to make and taste so delicious. I will definitely make this again! thumbs up here as well! Agree with you…easy and elegant. Your fish looks great. I was impressed with the nut flour coating on only one side…never done only one side before but it worked great. Hubby wants this one again soon. Hope you are enjoying your weekend. I have yet to get lucky with flounder being on sale. I’ve settled for sole and tilapia in the meantime. Great post!